I Love The NetBeans IDE! 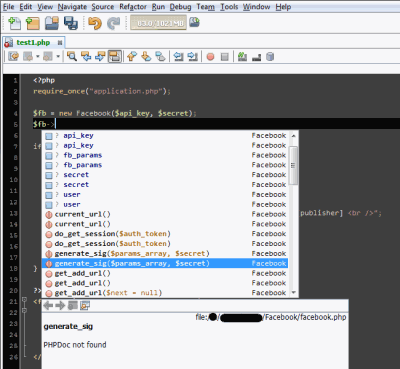 Home › Blog › NetBeans IDE: The Best for PHP Development? That changed when I upgraded to a modern dual-core Athlon II X2 computer with 4GB of RAM. I decided to give NetBeans another shot, since I now had faster hardware, and having seen many of my coworkers use it for a while. I was also attracted to its GPL2 license, respecting the user's freedom with the side effect of not costing anything. After using it for a few weeks it has gained my full approval and I can only list a few drawbacks. Create a new project from existing source file directory. It will keep the source files where they are (unless you want to copy them). This allows you to 'plug in' to an existing source structure without having to move anything around. Handy customizable windows, palettes, and tabs for optimized layouts. Option to disable autoscanning of source files, leaving it up to the user (or when you open/save a document). Figure 2: It even has MySQL code completion & hinting, although I haven't used it yet. Figure 3: CSS Code Completion. Guesses what CSS class I'm typing by parsing the project's HTML code. Probably because of the full featured code completion across all languages, for some projects, the scanning of source files can take a long time upon opening the project. For most of my projects this has been a reasonable 1-3 minutes. One project always takes 10-12 minutes, and I have yet to figure out why. During this initial scan, you can't really use the IDE.